The NGH team has over 30 years of Real Estate, Private Equity, Government Relations and Venture Capital experience. We leverage our collective experience to yield great returns, and mitigate risk . 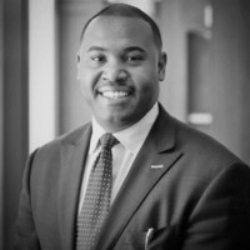 Trey Addison is a Co-managing partner and Co-founder of Nascent Group Holdings, LLC (NGH). Trey co-manages the day-to-day operations and the investment and acquisition strategies for NGH. Trey focuses on energy, real estate and manufacturing investment strategy, and financing. Trey has worked in business, government and government affairs his entire career. As AARP Ohio's lead lobbyist, Trey managed lobbying and regulatory affairs with a focus on public utilities, healthcare and banking. He helped save more than three billion dollars for consumers through regulatory and legislative electric utility lobbying. He led AARP Ohio's effort in crafting and passing significant legislation that has impacted more than two million Ohioans. He successfully led the lobbying efforts to introduce The Care Act, which ensures hospital patients’ family caregivers receive proper instruction for at-home care. It was signed into law by Governor John Kasich in 2016. He also played a critical role in the passage of Ohio House Bill 216, which modernized the scope of practice for nurses and was signed into law in 2017. Prior to joining AARP, Trey worked for U.S. Senator Sherrod Brown as Policy Outreach Director, where he focused on financial services, agriculture, energy policy, as well as corporate and stakeholder outreach. Trey was instrumental in developing strategy for the Senator, and lead one of the most high performing teams within the Senators office. Trey graduated from the University of Toledo in 2011. While in college, he completed extensive research in Mozambique and South Africa on energy and its impact on economic growth and instability. Trey was also a member of the University of Toledo Board of Trustees from 2009-2011. Trey is currently an Executive MBA candidate at The Ohio State University Fisher School of Business, Trey also received an Executive in Energy Certificate from The Ohio State University's Fisher College of Business. Trey currently serves as an Advisory Board Member to Vonno, LLC a clothing company located in Columbus, OH, and Sneak Peek, a startup shoe sourcing company located in Cleveland, OH. He previously served as, Vice Chair of the Board at Ohio United Way, and is currently a Board Member of MCS-Touch. In 2015, he was appointed by President Barack Obama and Governor Kasich to serve on the Selective Service Board in Ohio. He was also appointed by Governor Ted Strickland to the University of Toledo’s Board of Trustees from 2009-2011. Trey is a member of Sigma Phi Epsilon fraternity and resides with his wife, Whitney, in New Albany, Ohio. Will Allen is a Managing Partner and co-founder at Nascent Group Holdings, LLC. In his role as Managing Partner, Allen co- manages the day-to-day operations and investment and acquisition strategy for NGH. Allen attended The Ohio State University where he received his bachelor’s degree in Strategic Communications; he also received a certificate of completion in continuing education courses through the NFL Business Management and Entrepreneurial Programs at Harvard Business School and Kellogg School of Business. Allen has also completed internships with utility company National Grid and also with Congressman Bobby Rush on the Energy and Power subcommittee. Prior to founding Nascent Group Holdings, Allen was drafted by the Tampa Bay Buccaneers in 2004 and most recently played for the Pittsburgh Steelers. In 2015 Allen finished his NFL career after 12 successful seasons. In his collegiate years Allen was a member of The Ohio State 2002 National Championship team that beat the University of Miami. Allen's senior year he was named a consensus All- American. Allen is involved in the community and in business. Currently, he serves on the advisory committee for Be A Middle School Mentor that serves middle school students in Allegheny County through the United Way of South Western PA. He also serves as a board member for the Shyne Awards Foundation. In addition to serving those community programs Allen established the Will Allen Foundation. The foundation provides tools and resources to Educate + Influence + Empower people in his surrounding community. His business endeavors include investing in real estate and technology companies. Jason Williams, the President of Charter Properties, a privately held real estate investment company in Central Ohio. He is responsible for all operations of a real estate portfolio consisting of over 1,000 apartment and commercial units. The firm has grown by acquiring distressed assets and improving the tenancy and/or the physical asset to increase value. Mr. Williams started with the firm in 2002 as a project manager and became president in 2007. Jason has managed the day to day of several of these repositioning opportunities. Mr. Williams has a comprehensive understanding of the business and understands how to create and preserve value. His responsibilities include managing a staff of 25 asset managers and maintenance technicians, customer service and retention, conflict resolution, finance, and wealth creation/preservation. Mr. Williams most notable property turn around was an acquisition in 2011 of a 124-unit apartment community for $29,000 per door, reposition, hold, and then selling in 2015 for $52,000 per door. The asset required very little capital improvement as it was newer with few structural flaws. Instead the asset suffered from negative perception in the community due to a history of tenant problems. Through the implementation of firm community policies and a higher standard for approval criteria the community was turned around for the better, which translated into better tenancy, higher rents, fewer turns, and fewer expenses. All of which are a receipt for success. Mr. Williams is a graduate of Boston University where he studied Business Administration. He is also a Certified Apartment Portfolio Supervisor by the National Apartment Association and he is a licensed real estate agent in the State of Ohio. Jason volunteers with several national and local organizations that focus on helping families in need, such as the Salvation Army and the Charity Newsies. When not working he enjoys spending time with his wife of 15 years and children, being in the outdoors, or coaching lacrosse. Ian Magazine has been a founder, investor and finance and operating executive for a host of enterprises in the wireless communications industry and a highly successful serial entrepreneur who has worked with breakthrough innovations in a range of technologies from wireless power transmission, to biotechnology and 360° Videography. Mr. Magazine is best known for his work at Nextel, where he was an initial member of Nextel’s management team holding various leadership roles from the earliest days of the company through a strategic investment by Craig McCaw. Sprint acquired Nextel for a $35 billion in 2005. During his tenure Mr. Magazine was instrumental in leading the company through an intensive growth phase where he was responsible for the consolidation, integration and operations management of more than 180 of the company’s domestic and international mergers and acquisitions and led the acquisition of 30 businesses. Mr. Magazine has extensive experience in understanding the critical issues and opportunities that can affect building and growing a ‘game changer’ business. Most recently Mr. Magazine served as the Chief Financial Officer of PNA Innovations, a Carnegie Mellon University biotechnology and genomics startup where he led the company through launch and successful seed and series A financing rounds and helped negotiate the sale of the company to a tier one venture capital portfolio company. Mr. Magazine served as Vice President of Finance and Operations, Secretary and Treasurer of 4DK Technologies, a Multi-National wireless telecom solutions provider. Radius Networks acquired 4DK Technologies in 2014. From 2006 to 2009, Mr. Magazine served as VP of Finance and Administration and Assistant Treasurer at Cyren Call Communications, a company seeking to create a nationwide, seamless, ultra-broadband network for public safety communications. Mr. Magazine has 26 years of financial services industry experience including Chief Operating Officer of Reinheimer & Company; Nextel’s initial Investment Banking firm. Mr. Magazine Received a B.A. in Economics from State University of New York at Binghamton and completed M.B.A. courses at Pace University. Zachary Ellis, Jr. is Director of New Ventures at The Ohio State University. Zach has over 19 years of management experience and has been commercializing early stage technologies via startups and other vehicles for the past seven years. Before joining Ohio State, Zach worked at PepsiCo where he was a member of the corporate innovation and technology ventures team, leading venture investments and partnerships in food, agriculture and agtech. Prior to PepsiCo, Zach worked in technology commercialization for WARF at UW-Madison where he managed the cleantech/biotech IP portfolio. Earlier in his career, Zach worked in various consulting, business development and innovation roles spanning healthcare, government and hospitality. Zach began his career as an active duty officer in the US Navy. He is graduate of the US Naval Academy, has an MBA from Pepperdine University and a master's degree in biotechnology from the University of Wisconsin-Madison. Damian Georgino has more than 25 years of experience in sourcing, structuring, acquiring, financing and successfully exiting various global enterprises, with a focus on diversified industrials and water, wastewater, water as a natural resource, water POU and water technologies. He also has significant experience in energy and infrastructure. Damian has been the Managing Partner of Sewickley Capital Partners, LLC for 18 years (a family office). SCP invests in all aspects of water, wastewater and the water/energy nexus. Damian has successfully led, as a founding executive, the M&A, Corp. Fin, & legal aspects of 3 publicly traded water themed entities one of which was the largest water and wastewater company, USFilter. In addition, Damian was most recently an Operating Partner at Titan Grove Holdings, LLC where he invested in various water companies as well as renewables. He currently sits on the Board of Directors for Ayyeka Technologies, Ltd., am Israeli based IoT focusing on the emerging need for Big Data in Smart Water Systems/Smart Cities and serves as a model for “water-as-a-service”. Damian has also been a partner in global law firms where his focus was largely in the water/energy/food/infrastructure nexus completing numerous M&A, corporate finance, project finance and public and private investments across a broad spectrum of sectors including, water, wastewater, renewables and diversified industrials. Mr. Georgino is a frequent speaker concerning water, energy and infrastructure. Mark Winer is a seasoned financial executive with experience in financial and risk management. He is currently a Senior Advisor the Oakleaf Group and a Senior Consultant to Capital Markets Risk Advisors. Previously, Mr. Winer served as a Senior Advisor at Fannie Mae, where he oversaw analytics and advised on key policy issues including loan modification programs, housing reform proposals, enhancements to mortgage credit analytics, stress testing, capital standards, and capital market developments in mortgage credit exposure. He also acted as Deputy Chief Risk Officer and Head of Balance Sheet Management. Prior to joining Fannie Mae, Mr. Winer worked at PNC Financial Services Group for 10 years where he served as a Corporate-level Senior Vice President in a variety of roles including Head of Balance Sheet Management and Head of Comprehensive Risk Management. Prior to PNC Financial Services, Mr. Winer worked for 10 years at the Comptroller of the Currency where he served as their first head of Risk Analytics. In that role Mr. Winer oversaw the OCC’s review of national banks’ risk analytics and participated in the ongoing development of US and international bank capital standards. Mr. Winer holds a Doctor of Philosophy degree in Political Economy and a Bachelor of Arts degree in Mathematics, both from Carnegie Mellon University.